Totally removable for complete access to truck bed. Totally portable - take your Swing Case & content for work or play. Allows for 2-inch clearance above truck bed. Lockable lid to keep your belongings safe. Quick-release latch allows case to swing-out to you; swings back into locking position. Moisture seal to keep tools dry and ready to use. 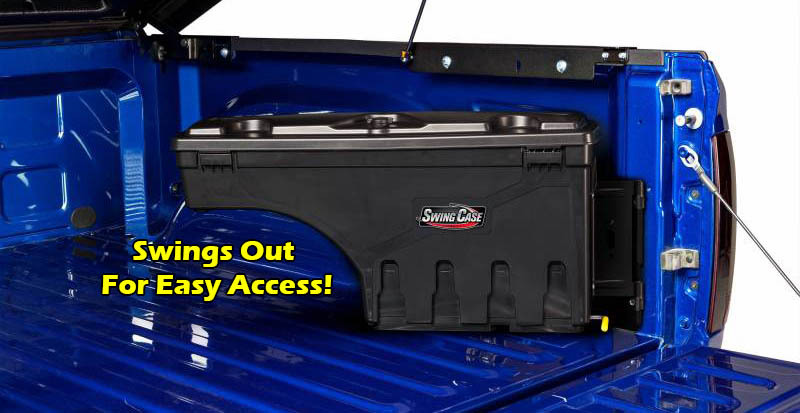 Holds up to 75-pounds of tools or cargo. Mirrored Swing Case model available for other side of truck bed. A versatile tool box even with cup holders - you may find your own convenient use for! The UnderCover Swing Case - the only swinging, removable, portable utility case for trucks on the market. Swing Away, Work or Play! New from UnderCover! Works with all tonneau covers: soft, hard, folding, rolling. Swings out to nearly 180° for easy tailgate access. Lightweight - made of the same rugged UnderCover® Tonneau ABS material.